The top three finishers in the Marlette 50K, Ben Tedore (front), Andy Anderson (middle) and Patrick Parsel, run along the Tahoe Rim Trail during the Marlette 50K on Sunday. Anderson won, Parsel was second and Tedore third. Find a photo gallery from the race at www.lefrakphotography.com. 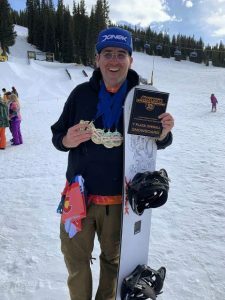 Andy Anderson of Truckee raced to a first-place finish in the inaugural Marlette 50K in the Spooner Lake Backcountry on Sunday. Competing in the 35-39 age group, Anderson covered the scenic 50-kilometer course in 3 hours, 55 minutes, 3 seconds. 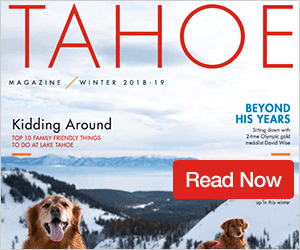 Patrick Parsel of South Lake Tahoe finished runner-up, posting a time of 4:08:06, while Ben Tedore of Reno was a split second behind to round out the top three. Incline Village resident Rachel Barth topped the women’s field and placed seventh overall with a time of 4:56:05. Kristen Kercher of Bedford, N.H., was the second woman finisher and 17th overall with a time of 6:19:20, and Tina Borcherding of Rancho Cordova was third among women and 19th overall in 6:26:56. Truckee’s Jim Telling placed eighth overall in 5:04:07. A total of 48 people started the run, with 44 finishing. 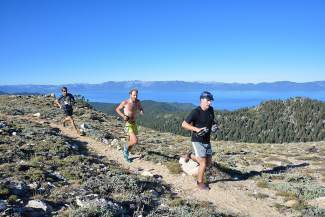 The race was part of Big Blue Adventure’s Tahoe Trail Running Series, which continues with the Heavenly Mountain Run on Aug. 31, the Emerald Bay Trail Run on Sept. 20 and the Lederhosen on Sept. 27. Find a photo gallery from the race here.